(CNSNews.com) - President Donald Trump has asked congressional leaders to return to the White House on Friday, after the House and Senate leadership races are over, to try once again to end the impasse over border wall funding. "I was a little disappointed with, I would say, some on the other side," House Majority Leader Kevin McCarthy (R-Calif.) told reporters after the attempted White House briefing. "Once the secretary started, Sen. Schumer interrupted her, they really didn't want to hear it. They challenged some of the points the secretary made." McCarthy said President Trump decided to delay the negotiations until Friday, when people might be "more willing to come to an agreement." "I think we can come to an agreement rather quickly," he said. Do you know in this caravan, one third of all the women...some are being raped, some are being violently treated. We have children that have challenges coming through; we have another caravan starting to come. We have a real challenge. And I think that's why both sides can sit own, find a compromise that actually secures the border. We had -- everybody in the room said they wanted to have a secure border. So maybe we work a combination to make it solved. And I think that's why the president -- I watched him in there stay very calm throughout the entire discussion -- he wanted to get the latest statistics going forward. And that is why we'll be back on Friday. We want to make sure the border's secure, but more importantly, we want to make sure this government is opened. McCarthy said he hopes Democrats will present a counter-offer on Friday. House Democrats on Thursday (today) plan pass legislation to fund six government agencies for the rest of the fiscal year; and the Homeland Security Department through Feb. 8, while border security negotiations continue. "Democrats have been committed to protecting our borders with the oath of office we take to protect and defend" Pelosi said. It has been very important to us, and we have commited resources to it when we were in the majority and will continue to do so." Schumer said Democrats have asked the president to support bills that will open up government. "The only reason that they are shutting down the government is very simple. They want to try and leverage that shutdown into their proposals on border security. We want strong border security, we believe ours are better. 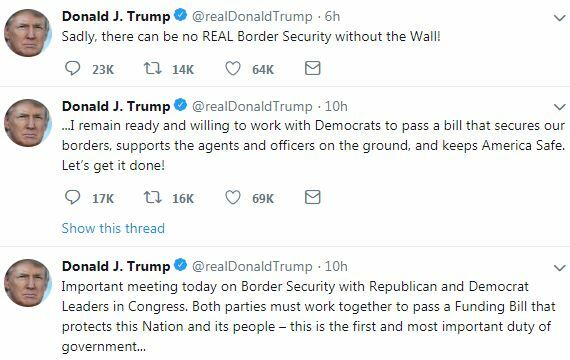 But to use the shutdown as hostage...is wrong, and we would urge them respectfully to reconsider and support these bills, which are bipartisan...open up the government as we continue to debate what is the best way to secure our border. Pelosi said Democrats are giving President Trump "a Republican path" to reopen government. "Why would he not do it?" she asked.